Would it surprise you to learn that you’re also a sales person? Though you may not immediately give yourself this moniker you absolutely should. After all, a substantial part of being a memorable, professional speaker is “selling” yourself. Prepare, Prepare, Prepare: The most impressive speakers are those who have obviously taken their speeches seriously and spent significant time getting ready. Ask Questions: Don’t know something? Pick up the telephone or send an email and get an answer. Never assume that it’s not important if you haven’t been told beforehand. Get a Good Night’s Sleep: A drowsy public speaker is typically a dull one. Get your rest and eat a light meal before your speech so you can “wow” listeners with your energy and enthusiasm. Know Your Topic Area Well: If you’re asked to give a speech, make sure you do your homework on the topic. Even if it’s something you feel 100% confident discussing, it’s still important to “brush up” on facts and figures in case you need them. 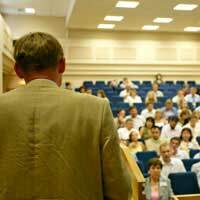 Be Energetic: When a public speaker is obviously enthralled by his or her subject area, the audience will be, too. Keep Your Audience in Mind: If you notice some listeners shifting in their seats or starting to yawn, offer to take a quick break. If an audience member coughs incessantly, leave the podium and bring him or her a cough drop. This shows compassion and will be remembered by those attending your speech. Involve Your Audience: Even if you’re expected to give a straightforward lecture, you can still involve your audience in various ways, including via question and answer sessions. Be Flexible: If you’re well-prepared and you’ve given a few speeches before, you should be able to switch gears in mid-speech. For instance, if a format isn’t working, why not quickly announce, “You know what? This just isn’t resonating with me. Let’s try something else!” Audiences love to be surprised by a “human” public speaker. Follow Up: Did you say during your speech, “I don’t know the answer to this, but I’ll get it to you”? If so, you need to follow-through on your promises. Stick Around: Unless you have to rush to another speech or catch a train or plane, stay in the room after your public speaking engagement has ended so you can shake hands, network, and discuss your speech with others. Clean Up: A messy public speaker who leaves the stage or room a horrid mess is unlikely to get a second chance to “perform”. Clean up after yourself, just like mum advised! Send a Thank You Note: This is something that far too few public speakers do in our cyberspace era. However, if you want to stand out and “sell” yourself to the event’s planners, send them a handwritten thank you note via postal mail. It will make a nice, unexpected, professional touch… and you’ll be well on your way to making another “sale”. Where are Public Speakers Needed?